There has been a fair share of water problems around the nation these past few years, particularly in Flint, Michigan. Consumers cannot be too careful about the water they are putting into their family’s bodies. Bottled water is not the only way to ensure your family enjoys fresh, clean water. Water filtration can work just as well in areas where water sources aren’t heavily contaminated. Not only does filtering your own water save money, it also reduces waste from plastic bottles. 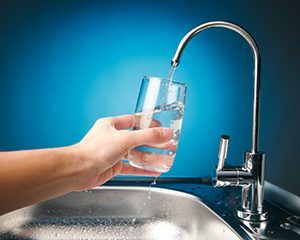 Filtering your water takes out any contaminants, including trace amounts of lead that could be in your tap water. Filtering your water can reduce the risk of gastrointestinal disease by as much as 80%. Not only will your water be safer, but it will be better tasting and smelling. There are a few ways to filter your water: through the tap, with pitchers, or with a whole house filtration system, but which is best? Filtering with pitchers and at the tap are point-of-consumption options. They filter the tap water that you consume. They provide a quick, convenient solution that you can refill whenever you like. If your drinking water is your main concern, they are a great solution for you. If, however, you are concerned about other uses of water, a whole home filtration system is the best option. A whole home filtration system is a point-of-entry filtration option. All the water flowing through your pipes will have particles and contaminants removed. You may not be actively consuming other water sources, but that doesn’t mean they don’t end up in your body. For example, you are unlikely to use a pitcher filter for water you cook with, wash produce with, or brush your teeth with. This still allows unfiltered water into our body. Another water source to consider is your shower. If you wouldn’t drink unfiltered water, why bathe in it? Shower water can contain chlorine and other chemicals depending on where your home receives its water supply. Not only are these chemicals bad to your skin and hair, but they can also in inadvertently enter your body. While you can buy filtered showerheads, the expense can pile up. Filtering (and replacing filters in) every shower and faucet is not a friend to your wallet or home design. Consider filtering your home’s water today. No matter which method you choose, you will likely notice a difference. Contact us today to discuss a water filtration system to further improve the water your family uses.